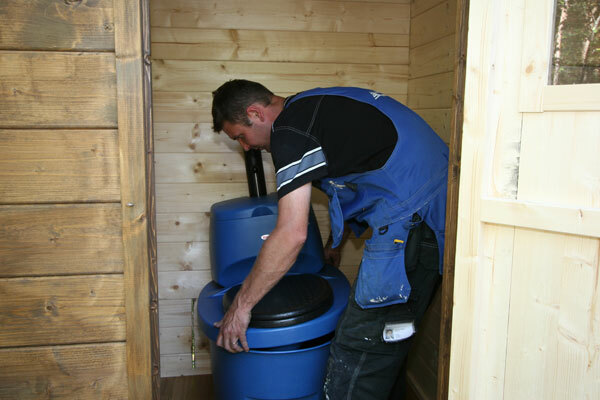 Biolan Separating dry compost toilet is ideal for allotments, farms, campsites and other activity outdoor centres. Attractive in dark grey, odourless operation is ensured by the vertical vent that needs to go up through the roof with no bends. The main advantage of urine diversion is that there is no maximum capacity of users as long as you change out the container. Urine diversion also minimises the volume of waste by 80% and drying the solid waste greatly controls odours. Click link for a full explanation on the pros and cons of urine diverting toilets. Free roof flashing now included !! This Biolan Separating dry compost toilet has two separate inner containers for solid waste. One of them is used at a time. When one of the containers is full, it is moved to the back and the other container is used. When both containers are full the toilet must be emptied. When emptying the toilet, cover each container with the lids. 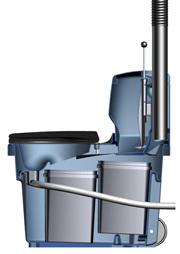 The vent pipe is disconnected from the toilet cover and the toilet lid is tilted to one side so that the inner container may be lifted out. Before the Biolan urine diverting compost toilet is used for the first time please add 3 cm of compost bedding at the bottom of the container. 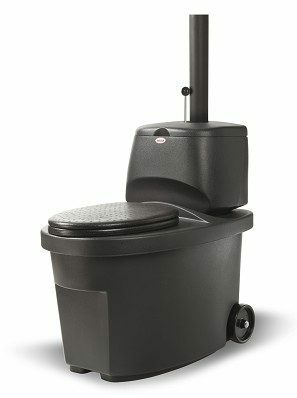 Users must always use the separating toilet in a seated position. The first few times you use it you should check that you are sitting in the correct position to ensure urine and solid separation. Don’t forget to tell guests too !! 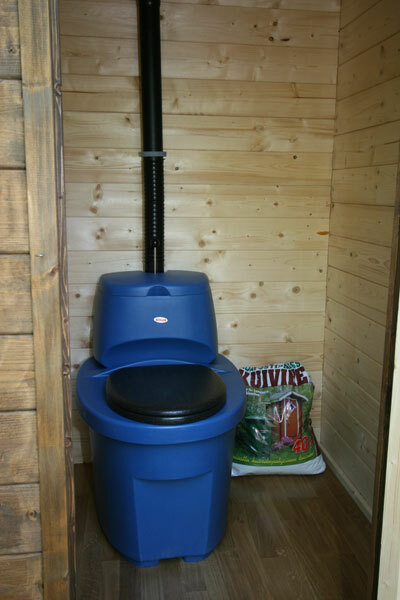 The Separating Dry compost toilet is installed at floor level in a horizontal position. When deciding the position of the toilet please take into account the vent stack, the liquid outlet and the removal of compost. The vent pipe runs from the toilet, straight up though the roof without bends. Bends in the vent pipe impede natural ventilation, causing odor problems. The non electric Biolan fan can be installed to boost ventilation. Please note that the device does not have a u bend trap. If the liquid is connected to a container the hose should be connected at the bottom of the container. 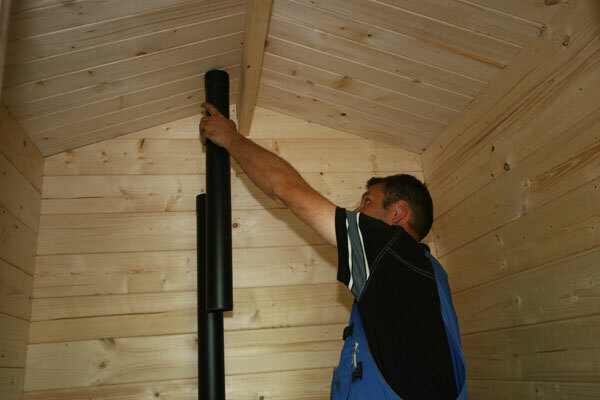 This way air cannot move around and carry smells from the container back up the pipe – thus minimising odours.